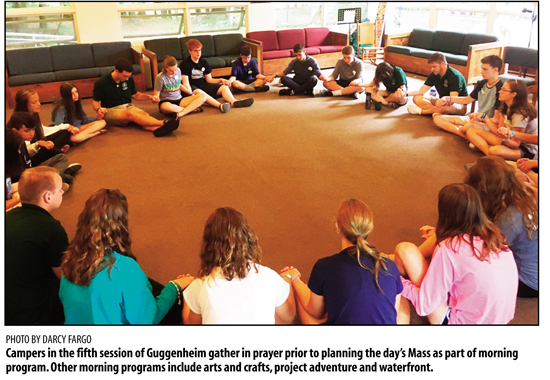 SARANAC LAKE – More than 300 youth from around the Diocese of Ogdensburg and beyond gathered for one of six sessions of hiking, swimming and praising and Camp Guggenheim this year. 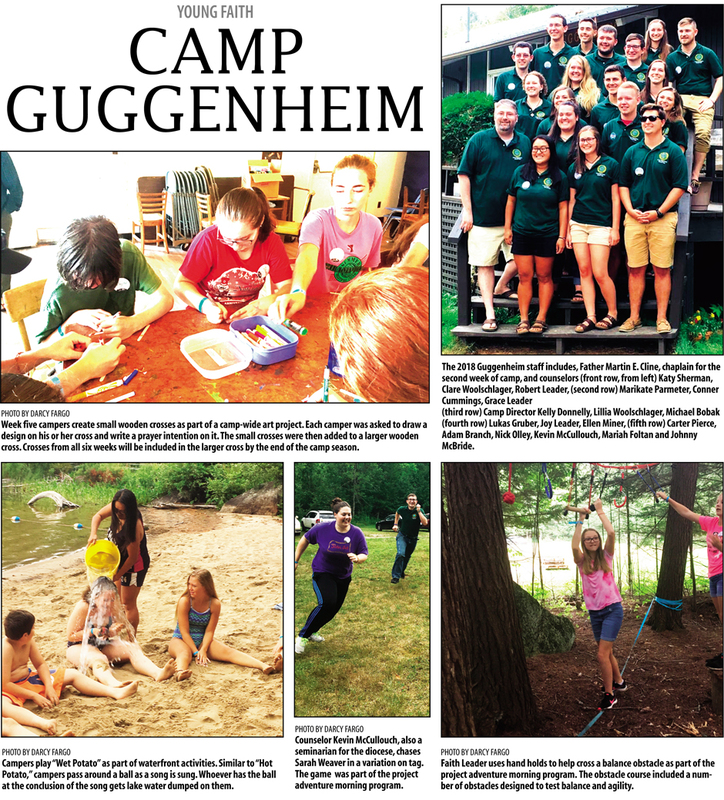 Camp Guggenheim welcomes around 60 campers per week. Youth ages 12 to 15 attend weeks one through five, while youth ages 16 to 18 attend week six. In all six weeks, the youth participate in a variety of activities encouraged to help them connect to one another, their faith and Jesus Christ. Campers arrive at the Saranac Lake facility on Sunday afternoon and stay until Friday afternoon. According to Donnelly, a typical day starts with morning prayer and breakfast. Campers then divide into pre-determined groups for morning programs. In project adventure, campers participate in team-based games, as well as a ropes course. Waterfront includes games and activities on the beach and in the lake. In liturgy, campers plan the evening Mass or reconciliation service. In arts and crafts, each camper makes a piece of a camp-wide project, and there’s generally time to work on independent art and craft projects. After morning programs, the youth gather for song practice, in which they practice the music for that evening’s Mass or reconciliation service before having time for lunch, a break and adoration of the Blessed Sacrament. 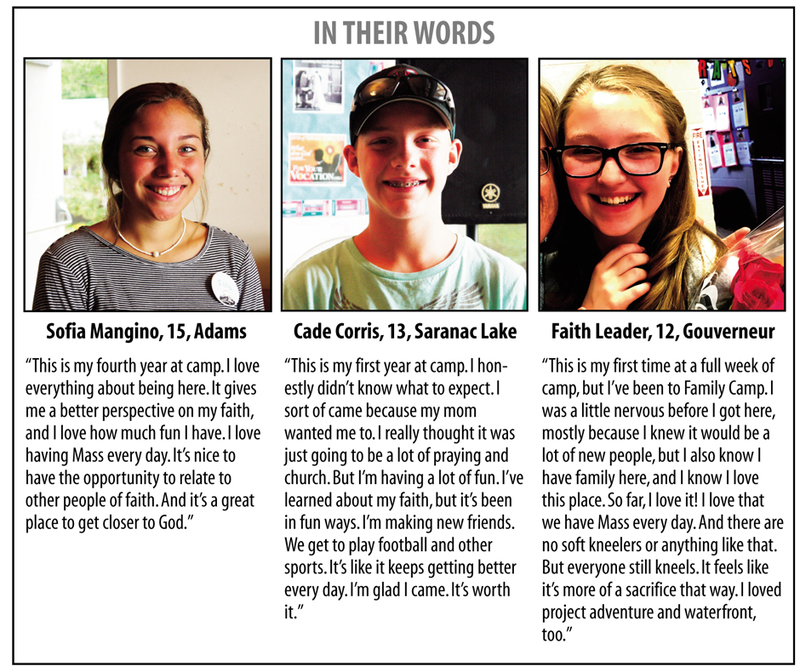 “With the exception of Friday, when the campers are getting ready to leave, we have adoration every day,” Donnelly said. Later in the afternoon, campers break up into smaller groups to participate in afternoon programs. The campers then get time at the camp’s private beach before participating in the evening Mass. The night ends with evening programs. Camp staff, all but two of whom attended Guggenheim as campers in their younger years, plan the programming in the 10 days prior to the start of the first session. “We get just over a week together to plan out the programming, complete all our training and learn any needed skills,” Donnelly said. On Friday, the last day of each camp week, parents and guests join their campers for a closing Mass at 1:30 p.m.